I had no idea what a great find this was and the condition is amazing considering it's age. Estate Auctions Inc. is pleased to announce another quality item up for auction on eBay. 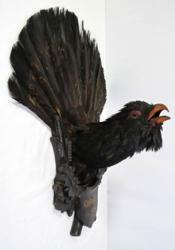 A vintage and very rare Auerhahn bird taxidermy mount dated 1948. The original information on the listing indicated that Norb Novocin, owner of Estate Auctions, Inc. was unaware of the rarity of the find but seven days into the auction a fellow eBay member informed him of the bird type. "On occasion we come across a item that has us stumped and with the amount of research we perform it's hard to believe, but sometimes it happens. I had a feeling there was something special about this piece and after I was notified of the bird type I did the research and my hunch was right. I had no idea what a great find this was and the condition is amazing considering it's age," states Norb Novocin, owner. The Auerhahn, known as the Grossehahn in Germany, is the largest of the European grouses, the Auerhahn may stand 40 inches tall, have a wingspan of more than five feet and weigh 12 pounds. This auction closes Thursday, November 8th at approximately 9:00 PM EST. Interest in this rare trophy continues to increase as the closing draws near. Rare and unusual items are the norm for the Novocin's. They continue to satisfy the taste of a loyal customer base and have even published a book about these experiences. Getting Sold On Ebay, The Treasure Hunter’s Guide To Making Money, which has received stellar reviews and is receiving national attention.